The Q45 was Infiniti’s flagship model for full-size luxury sedans. Its production began in 1989 and ended with the third generation in 2006. Today used Infiniti Q45 models are still being sold after multiple years since the line was discontinued. For the first generation, the car manufacturer used a 4.5 liter V8 engine with a maximum output of 278 horsepower. At that time, the model was competing with the major luxury car manufacturers. Stock models featured Bose sound systems and leather interiors. The second generation was manufactured between 1996 and 2000 using a 4.1 liter engine that produced a total of 266 horsepower. 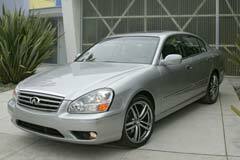 In 2002, Infiniti introduced the third generation that featured a 340 HP 4.5 liter engine and improved exterior designed. The front grill has been changed with new chromed elements added. Amongst the standard features, the Q45 had all-leather interior, power sunroof, keyless entry, rain detection sensors for the wipers and 8-way adjustable front seats. The third generation also included Bose sound systems, parking cameras and a trip computer. 1996 Infiniti Q45 1996 Infinity Q45 One of the last hand made models!